Popcorn makes great gifts for corporate clients! It's versatile! can be shared or enjoyed individually. Many times when you send a corporate gift like popcorn, it is shared by the staff. This gesture can affect many individuals that have input in dealings with your company. When they can all partake in the gift, it makes them feel appreciated and will remember who gave them such an enjoyable gift! Our wide range of flavors makes it easy to find something that everyone will like. Or maybe you'd like to enforce your brand by selecting popcorn based on your corporate colors. Different options for different budgets. We know that not every client is same. We also know that not every company has a large budget for gifts. With gift boxes starting at $19.95 and tins starting at $17, you're sure to find a thoughtful gift to share this season. Let us help the burden of gift giving off your shoulders. In addition to picking up gifts to personally hand out, we can ship your orders anywhere in the contiguous 48 states via FedEx. Just provide us with a shipping list and we'll take care of it! Corporate gifts shouldn't be limited to the holidays! Let your customers know you care throughout the years. We have (or can get) boxes and tins that represent what you want to say. So be it Merry Christmas, Happy Holidays, Welcome Home, or simply Thank You, we can help! If you're ready to get started, or if you have questions, use the form below to talk with our corporate order specialist. 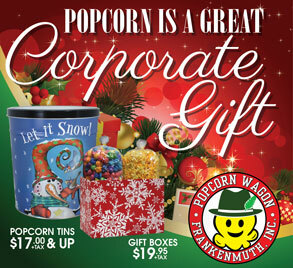 Why use the Popcorn Wagon Frankenmuth for your corporate gifts? We've been providing quality popcorn since 2001! We've helped many companies throughout the years make a lasting impression on their clients with our gourmet popcorn.